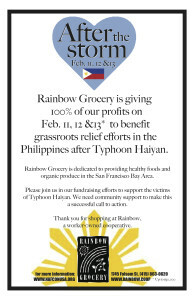 ￼Rainbow Grocery, in partnership with the National Alliance For Filipino Concerns (NAFCON), is giving 100% of our profits on Feb. 11, 12 &13* to benefit grassroots relief efforts in the Philippines after Typhoon Haiyan. 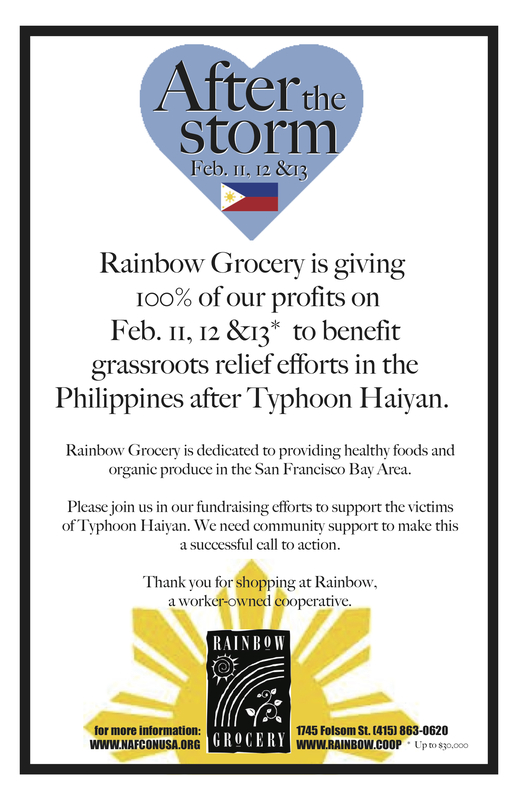 Please join us in our fundraising efforts to support the victims of Typhoon Haiyan. We need community support to make this a successful call to action. If you want to donate directly to National Alliance For Filipino Concerns (NAFCON), then follow the highlighted link. Thank you for shopping at Rainbow, a worker-owned cooperative. Thank You! Our friends in Philippines need all the help they can get!